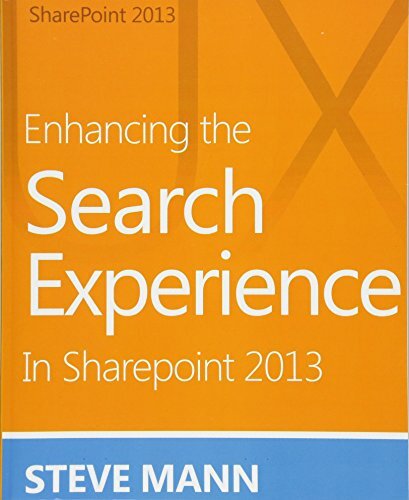 Search UX Overview This book provides many ideas and steps for enhancing the search experience across various aspects of SharePoint 2013 Enterprise Search. Enterprise Search in SharePoint 2013 Server provides an abundance of functionality and search capabilities for your SharePoint environment. There are many ways to enhance the overall search experience for your users by customizing features, templates, settings, configurations, etc. Therefore, Steve Mann has provided an easy step-by-step guide to assist you in enhancing the overall user search experience. He has created this book to visually step you through modifications and customizations to further improve the Enterprise Search Center user experience within your SharePoint enterprise. Topics Include: · Enhancing the Search Navigation · Improving Image and Video Results · Handling PDF Documents · Promoting Results · Suggestions and Spelling Words · Sorting and Refinement of Search Results · Providing Consistent Results and Experiences · Enhancing Search Keywords · Instant and Cascading Refinement of Multi-Value Properties · Customizing Search Result Item Templates and Hover Panels · and much more! End-to-End Solutions There are two bonus chapters adapted from Steve’s walkthrough guide that provide end-to-end scenarios and modifications: · Enhancing the Search Center UX with a Custom Vertical · Incorporating External Data using BCS into the Search Center UX "Just show me how to do it!" If you find yourself screaming this while reading technical books, then this book is for you. There are plenty of screenshots and no individual steps that leave out critical information. Each section clearly shows you what to do, how to do it, and what the results look like.